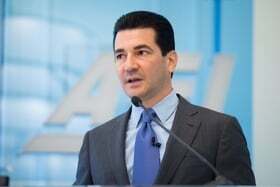 Dr. Scott Gottlieb, who has often said red tape hampers competition in the pharmaceutical market, has been nominated to be the nation's top federal regulator of drugs and devices. The White House Friday announced that President Donald Trump was choosing Gottlieb, who has strong ties to Wall Street and the pharmaceutical industry, to lead the U.S. Food and Drug Administration. Trump has said he wants to expedite what he calls the "slow and burdensome" approval of drugs and devices at the FDA, which regulates everything from pharmaceuticals to electronic cigarettes. Gottlieb has generally supported loosening the agency's oversight of wearable devices and smartwatches. Gottlieb, 44, served as a deputy commissioner of the FDA under President George W. Bush. He earlier served as a senior adviser to the CMS administrator. Most recently, he's been dabbled in punditry as a resident fellow at the conservative American Enterprise Institute and a partner in the venture capital firm New Enterprise Associates. Since leaving the FDA, Gottlieb has served as a board member or adviser to at least nine drug and device makers. He's been a consultant to GlaxoSmithKline's product investment board; a managing director at T.R. Winston & Co. merchant bank, which specializes in healthcare; and a clinical assistant professor at New York University School of Medicine. He also is a policy adviser to the National Coalition for Cancer Survivorship. As he begins his confirmation hearings, Gottlieb may disclose even more connections or financial deals including stocks or other investments that might create a conflict of interest. Advanced Medical Technology Association CEO Scott Whitaker congratulated Gottlieb on his nomination, calling him a "strong choice" given his time as a leader at both the CMS and the FDA.